lately, i've been really into jam. so basically, jam is my jam. am i wrong? i had extra strawberries from a brunch and i was thinking of all the things i could make with them. 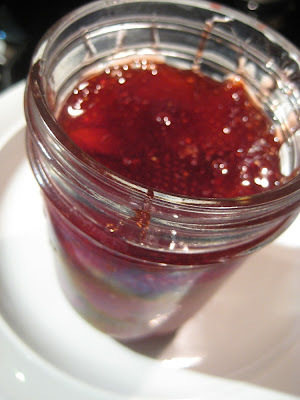 i was looking in nigella lawson's "how to be a domestic goddess" cookbook and i saw this really simple recipe for cooked strawberry jam. and it had basalmic vinegar in the recipe. sold! basalmic is pretty much a magic ingredient and makes most things infinitely better. it's supposed to bring out the flavor of the strawberries. and there is no pectin! the recipe calls for preserving sugar, but i just used granulated and it worked out just fine. while cooking, she doesn't use a thermometer and cook it to a certain temperature, she uses a method where she puts a saucer into the freezer before she starts, and while cooking, she takes the pan off the heat and drips a teaspoon or so of jam onto the saucer. then if the jam wrinkles when she pushes at it with a finger, then she knows it's ready. i did this as well, but i was looking for a bigger wrinkle than i needed, so i overcooked it a tiny bit. it's still delicious, just a tiny bit stickier than it should be. stick a saucer into the freezer. put all the ingredients into a wide saucepan and stir with a wooden spoon to make sure all the fruit is coated. 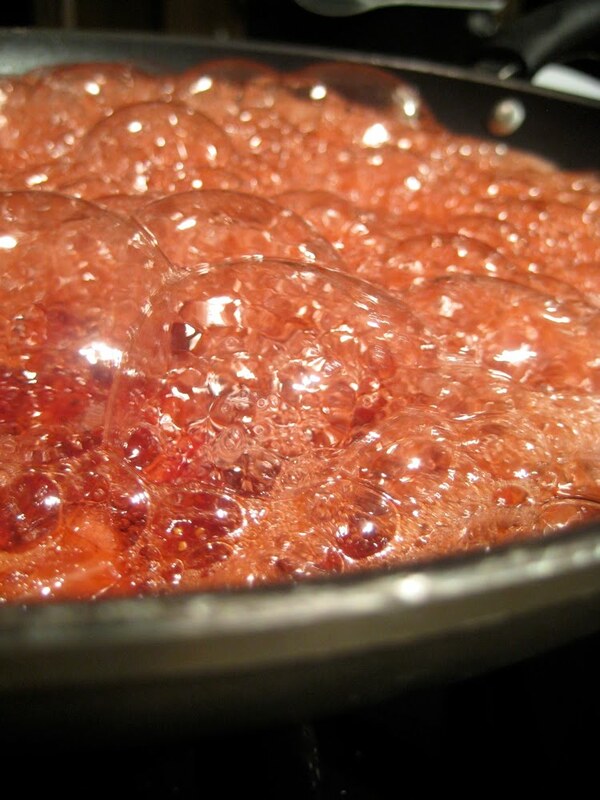 put the pan on a low heat and, stirring every now and again, bring to a boil. let boil for about 5-8 minutes, depending on the size of your pan, and start testing for setting point from 4 minutes, taking the pan off the heat and putting a scant teaspoon onto the saucer. leave it to cool for about 10 seconds or so and then poke at it to see if it's ready (look for a slight wrinkle). when you've reached this point, leave the pan to cool for 20 minutes before decanting into the cleaned, prepared jars. makes about 3 1/4 cups. 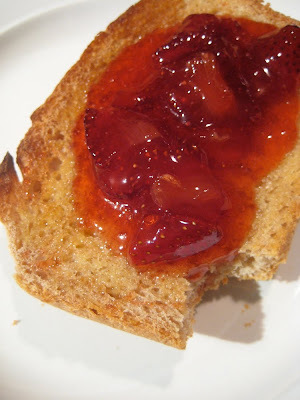 I love homemade jam but have never tried it myself. Maybe I will now . . . thanks for inspiring! I love jams! They are always present in my pantry.